Alkali bee beds are maintained by farmers near Touchet, Washington to pollinate fields of alfalfa, grown there for seed. The beds are typically a few acres in size and provide a nesting place for the bees, which can increase seed production by as much as 70 percent. Alkali bees are better than honeybees for pollinating alfalfa, as they don’t mind the explosive pollen release of the alfalfa flower. Alkali bees nest underground. They prefer salty soil surfaces which retard evaporation and discourage plant growth. 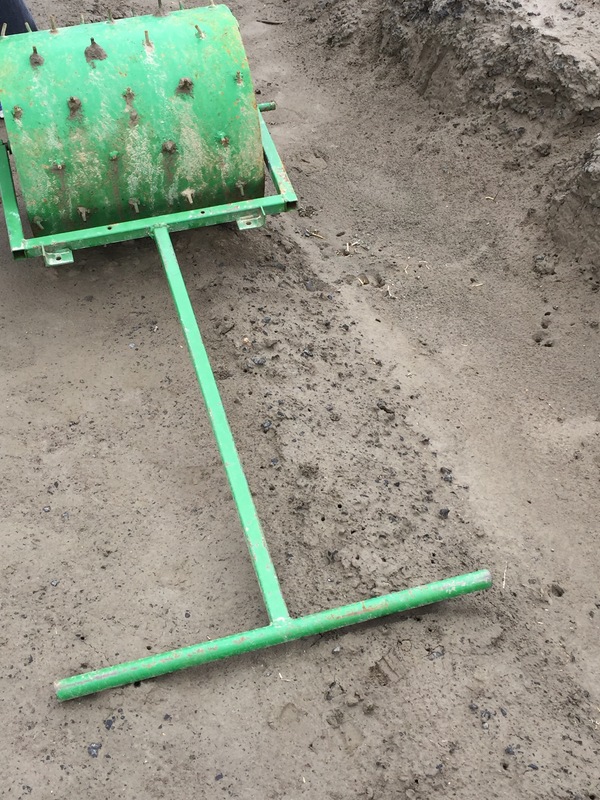 The soil has to be the right texture, density, and have the correct moisture levels for successful nesting. In addition, the water potential of the larval food provision mass has to be low so it does not mold. Growers apply high levels of sodium chloride to the bee bed surface, and the soil is sub-irrigated to keep the salt near the surface and the subsurface soil moist. 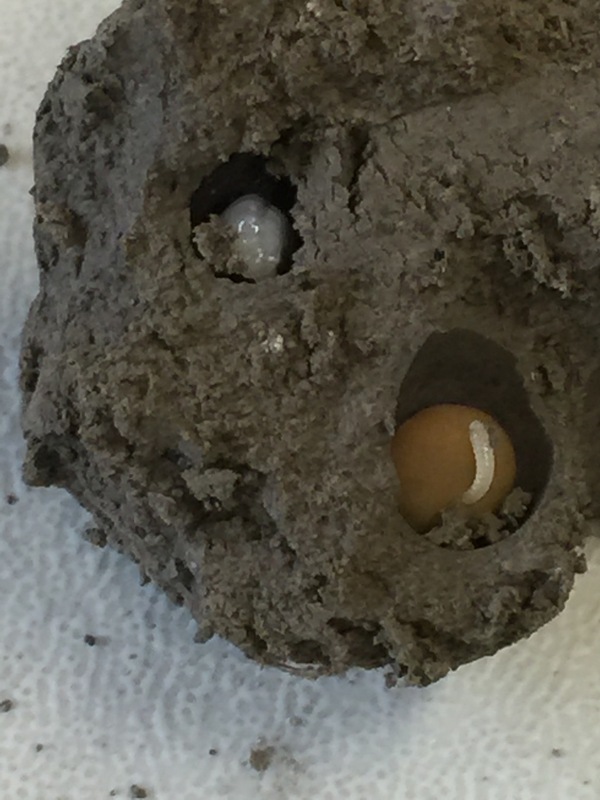 Bottom right: a white larvae on a gold colored provision mass inside one of the tunnels dug by the female. The female digs a tunnel down to a favorable depth, typically 15-20 cm or more, hollows out a spheroidal shaped cell around 1 cm diameter, and carefully coats the inside of the cell with a special secretion that appears to form a hydraulic and vapor barrier between the soil and the nest contents. She then builds a provision mass from pollen and nectar, shaped like an oblate spheroid with major axis around 6 mm and minor axis 3-4 mm. One egg is laid on the provision mass (which provides food for the larva), and the mother bee then seals up the entrance to the cell and moves on to the next one. The female coats the inside of the cell with a special secretion that appears to form a hydraulic and vapor barrier between the soil and the nest contents. 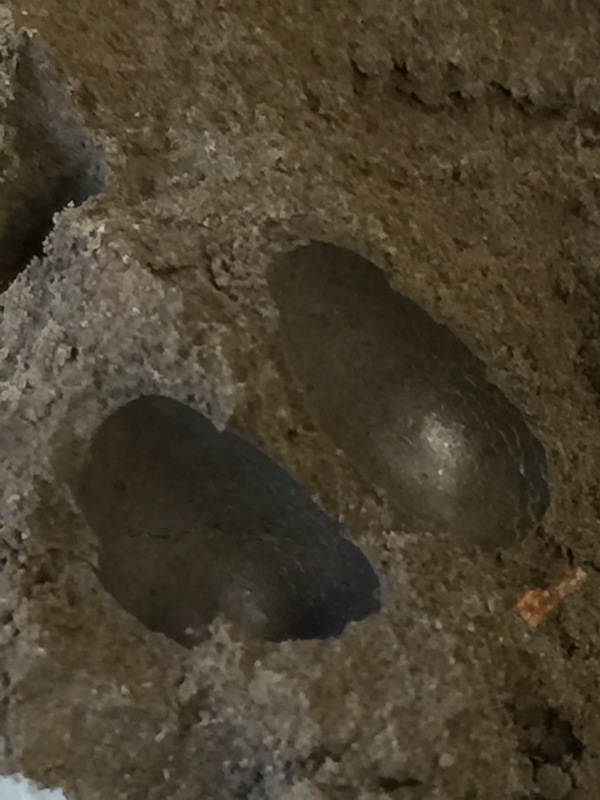 In order to understand moisture relations between the soil, the larva, and the food provision mass, Dr. Cane carefully excavated three soil blocks from one of the bee beds, dissected them to find nests, and Dr. Campbell helped measure water potentials of the eggs, larvae, and provision masses. They also measured matric and total water potentials of bee bed soils. A Sample Chamber Psychrometer is the only water potential device with a small enough sample chamber to be able to measure individual eggs and early-stage larvae, which it did. The provision masses were too dry to measure with the psychrometer, so several provisions were combined (to provide sufficient sample size) and measured in a Dew Point Potentiameter, along with the soil samples. 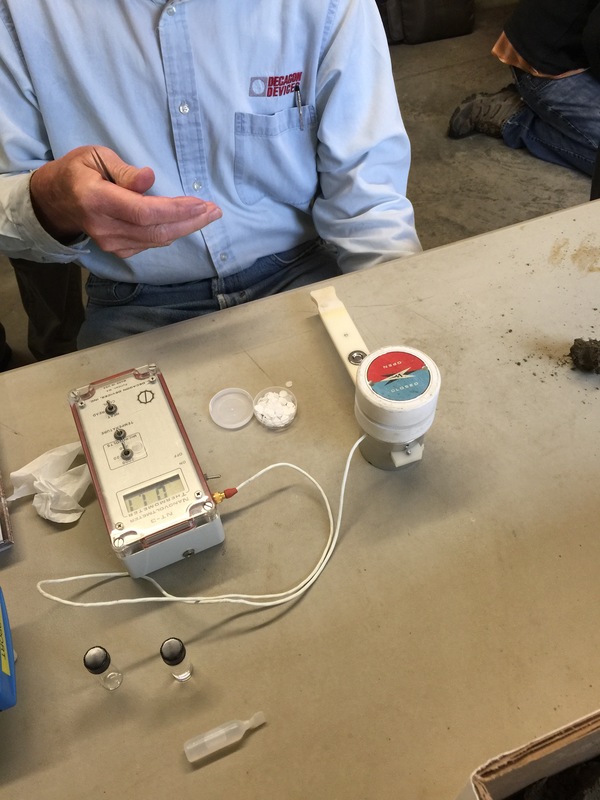 Dr. Campbell measured matric potential of the highly saline soils using a tensiometer. 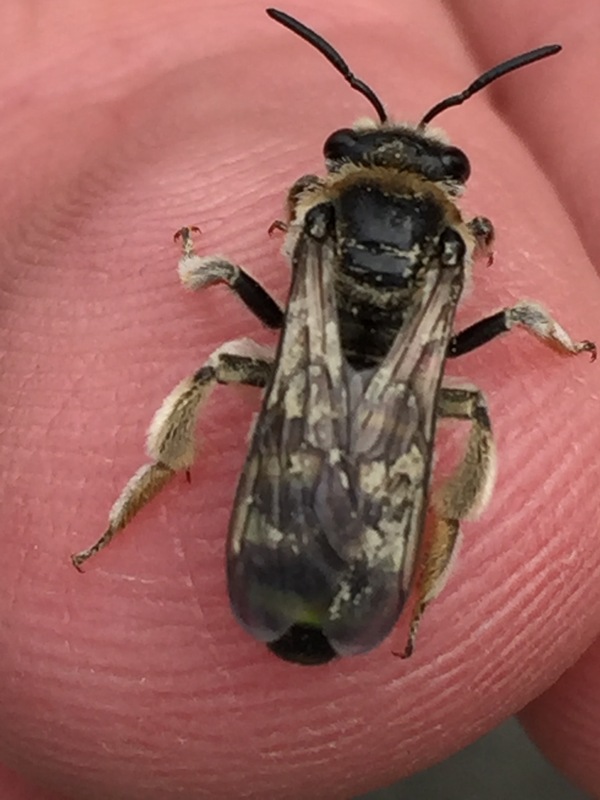 Dr. Campbell thinks matric potential is important in determining physical condition of the soil (how easy it is for the bees to dig and paint the inside of the nest), but probably has little to do with bee or larva water relations. The water potentials of the eggs and larvae were low (dry), but within the range one sees in living organisms. There was a consistent pattern of larva water potential decreasing with larval growth. 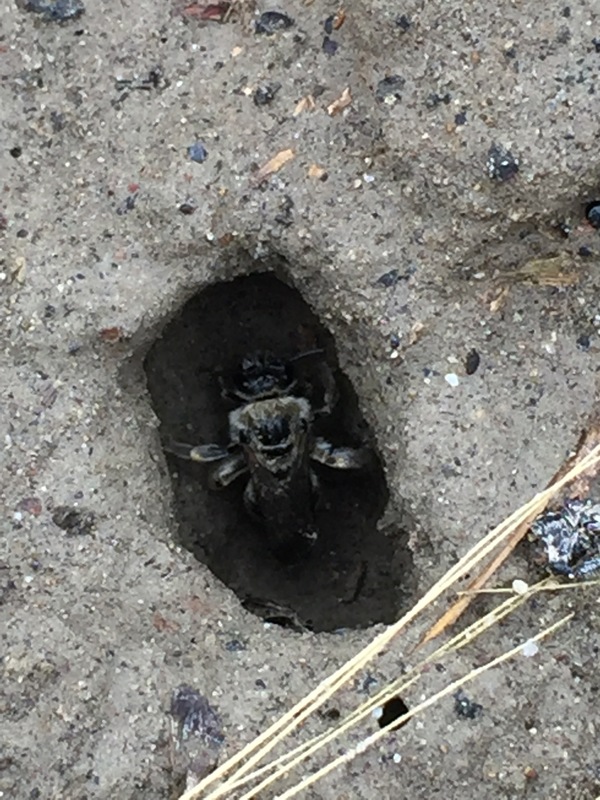 This alkali bee seeks shelter during the rain in a previously dug tunnel. Tool the grower uses to punch holes in the nesting beds for the bees to tunnel into. How Do Larvae Stay Hydrated? In the future, Dr. Campbell is hoping to see more experiments that will answer some of the questions raised, such as measuring individual provision masses to determine why there is some variation in water potential. Dr. Cane will be undertaking experiments to measure moisture weight gain of new provisions exposed to the soil atmosphere of the Touchet nest bed soil. Campbell, G. S. 1985. Soil Physics with BASIC: Transport Models for Soil-Plant Systems. Elsevier, New York. Campbell, G. S. and J. M. Norman. 1998. An Introduction to Environmental Biophysics. Springer Verlag, N. Y.
Rawlins, S. L. and G. S. Campbell. 1986. Water potential: thermocouple psychrometry. In Methods of Soil Analysis, Part 1. Physical and Mineralogical Methods – Agronomy Monograph 9, 2nd edition.